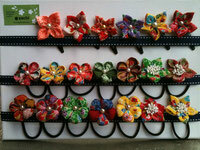 Scroll further down to see our most popular accessories: Hair ties, brooches, earrings . . . More products coming soon! Full aprons: Too good for the kitchen! You will want to wear these aprons everywhere. Hand sewn like all our products, their base fabric is denim, finished with a variety of hard-wearing Japanese cotton prints. Long straps for easy tying at front or back and pockets for small kitchen essentials. We make to order; please contact us or visit us at a market to confirm current fabric availability. 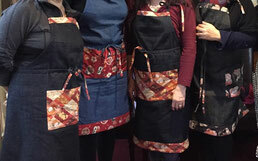 These aprons have proven very popular among individual customers and groups, including a flower arrangement club (pictured) and of course people who love to be in the kitchen or in charge of the barbecue. The aprons are also featured at the wonderful Under the Pickle Tree cooking school. 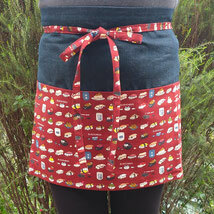 Wrap-around cafe aprons: Attractive and practical! 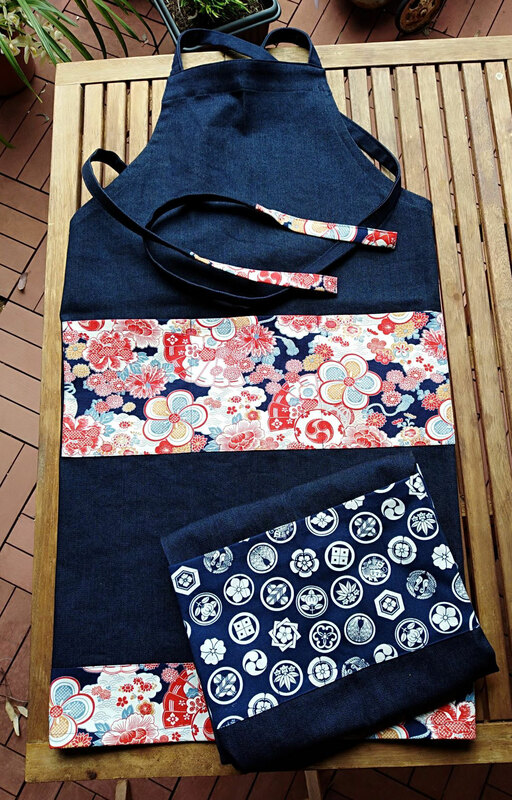 Denim waist-wrap aprons with finished using vibrant Japanese cotton prints. Simple to wear, durable and practical, with two handy pockets at the front. Many people also wear them as wrap-around skirts. Too good to keep in the kitchen! Currently selling at markets only. We have new fabrics coming in all the time, so please come and see what's currently on offer. We can also take orders. Not only are the fabric designs stunning, but these pants are really comfortable too! Many designs and sizes available. You can see our current selection at our market stall. We also design and make to order - contact us for details! Flower diameter is approx. 4.5 cm. Clip length is approx. 5 cm. Flower diameter is approx. 3.5 cm. Clip length is approx. 5 cm. Soft chirimen silk fabric over hard rounded base. High-quality elastic ties. Diameter is approx. 4.5 cm.